Stocks finished the week up over one percent as the Fed held steady on rates but provided positive commentary on the U.S. economy. With the lack of Fed action, the 10-year Treasury yield fell 0.06 percent to close the week at 1.63 percent. After a strong week in the equity market, returns for September may end with a plus sign which would buck historic trends as September has historically been the worst month of the year for returns (see chart below). Fortunately, looking at the calendar indicates the fourth quarter is a good time to be invested. Earlier this week, the Federal Reserve held its benchmark rate steady at 0.25 to 0.50 percent. While Fed Chair Yellen stated that the economy has improved, she was not ready to increase rates. Despite her position, there was a shift in the board and some previous “doves” voted to raise rates. With a healthy employment market and inflation trending higher, it is going to be difficult for the Fed to maintain the current level of rates. With two meetings remaining in 2016, we believe the Fed will increase rates once before year-end. However, this will not result in a major shift upward in longer-term interest rates due to historically low interest rates outside the U.S. 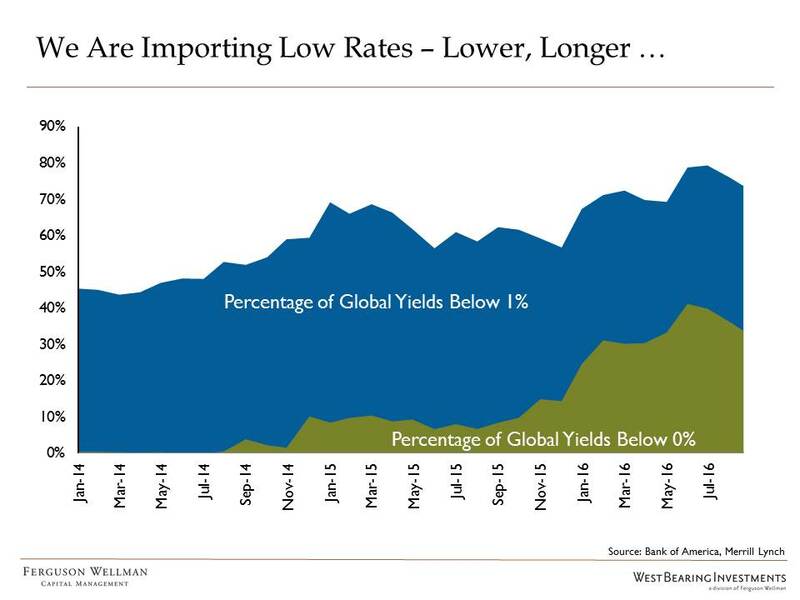 The chart below shows the amount of global sovereign debt yielding below one percent, which will put a ceiling on our longer rates moving meaningfully higher in the near future. One place where rates have been low for a very long time is Japan. In fact, in recent months, the yield on the 10-year Japanese Government Bond (JGB) was under zero percent. The Bank of Japan has now stated that they are going to target the 10-year JGB at zero percent. This is an admission that negative yields are bad for the financial system, specifically for banking, insurance and pension funds. Time will tell if the Bank of Japan can manage this target and how it will affect the financial system. Either way, we remain cautious on Japanese equities and maintain an underweight position in client portfolios.